The Silberhorn (3,695 m) is a pyramid-shaped mountain of the Bernese Alps, to the northwest of the Jungfrau of which it is a satellite peak. A first attempt to reach the summit of the Silberhorn was made in June 1863 by M. v. Fellenberg from the Stufensteinalp on the east side of the valley of Lauterbrunnen. After 9 hours of most perilous climbing the party encountered an impracticable precipice of rock, and were forced to return. In the following month of August MM. Badeker and v. Fellenberg, with two guides of Grindelwald, and others, reached the summit from the Wengernalp. Ascending by the Guggi Glacier, they passed a night on the rocks at the foot of the Schneehorn, a buttress of the Jungfrau dividing the Guggi and Giessen Glaciers. On the following day they gained the desired summit by a long and difficult circuit under the cliffs of the Jungfrau. The still longer and equally difficult ascent of the Jungfrau was effected from this side for the first time two years later. The northwest ridge was first ascended in 1865 by the Rev. James John Hornby, Rev. Thomas Henry Philpot, with guides Christian and Ulrich Almer, Johann Bischof, and Christian Lauener. In a 1968 letter, J. R. R. Tolkien identified the Silberhorn as it appeared to him when camping near Mürren in 1911 as "the Silvertine (Celebdil) of my dreams". ^ Retrieved from the Swisstopo topographic maps and Google Earth. The key col is the Silberlicka (3,650 m). 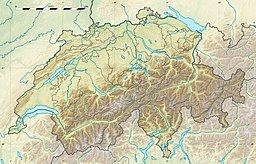 Wikimedia Commons has media related to Silberhorn.